The book Die Marxsche Konjunkturtheorie by Alfred Müller will never appeal to a large readership. It is written for the relatively small group of economists, that strive for an on-going development of the theory of Marx. This shortcoming is hardly surprising, because the text is a reprint of the thesis, that in 1981 brought in the doctor's diploma to Müller. The central theme of the book is the marxist crisis theory, which here is notably coupled to the tendency of the falling profit rate. That is striking. The accumulation of the capital goods is so overwhelming, that the surplus value fails to maintain a comparable growth rate. This phenomenon is called over-accumulation. Marx himself has never worked out this idea into a closed and unambigious crisis theory. Here and there in his many books remarks about the crisis can be found, that are mutually different and sometimes vague or even contradictory. Müller tries to reconstruct the considerations of Marx, and to complete them in a sense. He believes that the essentials of Marx should be uncovered, and that the text fragments should be mutually consistent. So his work is an interpretation1. This endeavour is in itself sufficient reason to read the book, and to look if Müller succeeds in his aim. But yet more instructive than the search by Müller is the method that he employs in order to reach his goal. For contrary to most marxist economists Müller refers in a persistent way to the modern paradigms and insights. The vision of Marx and Engels is again and again compared with the presently common theories. Thus Müller succeeds in making his study appealing and relevant, also for those economists who are not marxist. Moreover Müller introduces the mathematics in his presentation of the marxist theory. That is clearly an improvement with respect to the old masters Marx and Engels, who have expressed their considerations mainly in words. Mathematical formulas make the theory more transparent and succint. Although your reviewer was convinced that he understood the explanation of the old gentlemen, Die Marxsche Konjunkturtheorie has helped to reveal the true richness of their ideas2. According to Müller the theory of Marx is dynamic. In other words, the economic quantities are subject to a continuous change. In this respect the theory is fundamentally different from the neoclassical paradigm, that portrays the economy as a state of equilibrium. Müller administers justice to the marxist dynamics by the general expression of his formulas in terms of relative changes of the variables. When he studies a quantity X, then he is mainly interested in the behaviour of X' = dX / X, where dX is a very small change of X. In fact he employs differential equations, that is to say, the relations between the differentials dX of the various quantities3. In the first chapter all possible causes of crises are neatly summed up. Marx himself attributes the crisis to the accumulation of capital, because she raises the mechanization in a continuous way, and with that also the labour productivity (ap). The crisis is not caused by the profit, in the form of the surplus value m, but by the rate of surplus value m' = m / v, where v represents the wage sum. In any case this makes clear, that the production is responsible for the crisis, and not the circulation of the goods, or all kinds of psychological and social factors. There is over-production. The result may be, that also a credit crisis erupts. In the second chapter the terminology of the conjuncture theory is explained. The third chapter discusses in detail the various types of definitions for the labour productivity. Here also the material (physical) quantities and value variables are related to each other. This discussion is essential, since due to the mechanization the piece-value is continuously falling. In the marxist view of the matter the mechanization causes a reduction of the labour costs. This merits some reflection. Yet in most marxist literature the fall of the piece-value is mentioned only in passing4. This chapter mainly discusses the technological progress, which is the foundation for the mechanization. According to Marx the substitution of the production factors always implies a technological progress. The quantity of the means of production (capital) is persistently expanded. Everything is oriented towards advantages of scale, aiming to produce in a cheaper way. At the macro-economic level this has the additional advantage that the nominal wage can remain low. The consequence is that in this theory the growth is endogenous. And Marx denies the possibility of growth along a path of equilibrium, because the economic structure is transitional. According to Müller the mechanization accelerates during the recession, because then the enterprises fight for their survival. They rationalize their production process. The crisis does not emerge from a falling consumption of the people, but from a hesitation in the investments, so in the productive demand for capital goods. In other words, the entrepreneurs can no longer find profitable applications for the offer of equipment, and thus nor for the yet unemployed workers either. The capitalists are confronted with a falling profit rate. It is capital itself, which conjures up the crisis5. This has motivated Marx and Engels to remark: "The bourgeoisie [here in the form of the heavy industry EB] produces her own grave-digger"6. Incidentally Müller notes that until now no empirical evidence has been found for or against the hypothesis of the falling profit rate. According to Marx the wage level develops in connection with the unemployment, that emerges due to the mechanization. By definition a wage rise reduces the profit. In the recession some productive capital is destroyed, because it must by necessity be shut down. That capital disappears from the economy, and with it the accessory labour. However this destruction does not hurt the profit rate. The profit rate does not yield. Moreover in the recession the labour productivity rises, and therefore also the value of the still productive capital diminishes. The shrinking value of the accumulated capital betters the chances for profit, and allows for a new period of prosperity and activity. That is a windfall. The business cycle can start again. Tripping is no disgrace (but it does hinder the advancement). The fourth chapter presents a theory of over-accumulation. According to Müller a crisis comes into existence, as soon as the marginal profit rate gets smaller than the average profit rate. The last added capital goods do not succeed in producing the on average expected profit. The crisis begins, because the transformation of capital goods into the creation of surplus value is insufficient. In fact she is in the last resort caused by the intermittent development of the innovations and investments. The consumptive demand is just a secondary factor in the crisis. Neither does Marx consider the interest rate as a source of crises. The difference with the model of Keynes strikes the eye. In other words, in the interpretation of Müller an economic equilibrium does not exist. The average profit rate is simply an average, and not an equilibrium value. The falling profit rate extorts fluctuations in the innovations, that change both the composition and value of the capital. The falling profit rate is both a long term effect and the cause of crises. Therefore the recessions repeat themselves, to the dismay of the entrepreneurs. 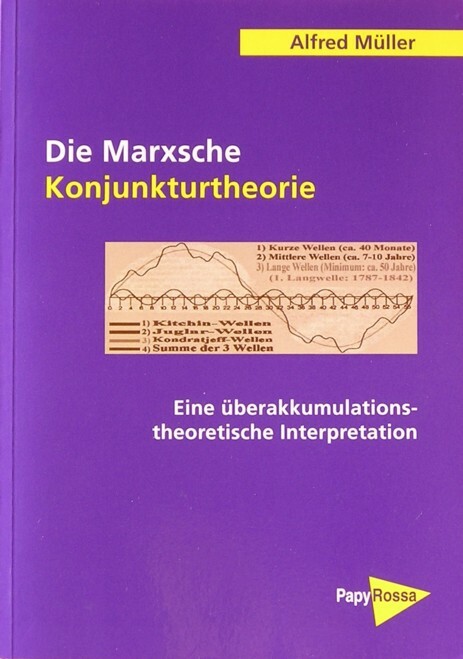 In conclusion your reviewer summarizes: Die Marxsche Konjunkturtheorie is a versatile text. The formulas make the theory of Marx more accessible, also for beginners. The numerous referrals to other paradigms (neoclassical, Keynesian, neoricardian) will appeal especially to advanced economists. The presented interpretation of the theory of business cycles tries to resolve the marxist quarrels in a rigorous way. The comprehensive arguments of Müller (460 pages) makes his interpretation plausible, so that she is the scientific equal of the other paradigms. Of course the book is not infallible. Some aspects of the theory of Marx are not addressed. Müller is not interested in the marxist schemes, that describe the exchange proportions between the various productive departments, because they suggest the existence of an equilibrium. This part of the theory of Marx is excluded. Also he does not consider the often heard criticism of the marxist transformation of product values into prices. Müller states that this criticism only holds for states of equilibrium. If the equilibrium model is rejected, then also the transformation problem is unfounded. Yet your reviewer is not completely satisfied with this view. For it implies that the price transformation of Marx can not be used for an economy in equilibrium7.